NEW YORK — Only a small percentage of Americans believe drug companies and health insurers are on their side when it comes to care versus dollars, a new Harris Poll finds. The Nielsen research subsidiary said Tuesday that 9% of U.S. consumers think pharmaceutical and biotechnology companies put patients over profits, and 16% believe health insurance companies do so, according to an online survey of more than 1,000 adults. Americans’ level of trust isn’t much higher on the other side of the equation, as just 36% of those polled believe health care providers such as doctors and nurses put patients over profits, compared with 23% for hospitals. All health care stakeholders — hospitals, health insurers, pharmaceutical companies, health care providers and store pharmacists — face consumer skepticism, but some experience it to a greater degree, the Harris Poll Reputation Equity and Risk Across the Health Care Sector report found. 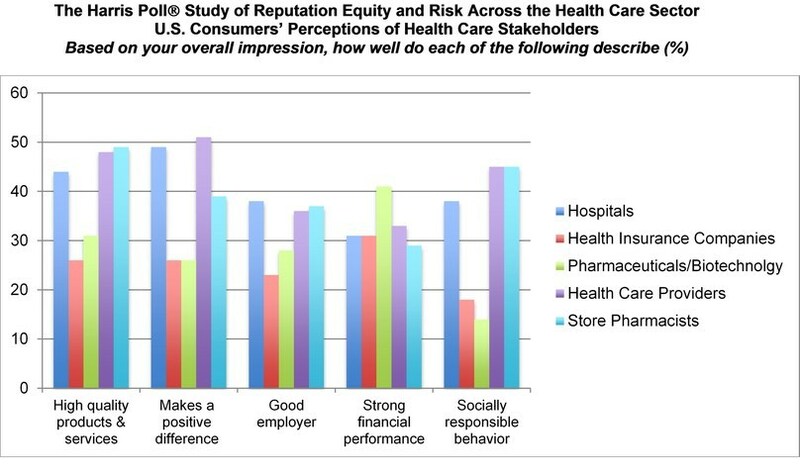 Forty-nine percent of consumers surveyed think store pharmacists and health care providers (48%) offer high-quality products and services, compared with 44% for hospitals, 31% for pharmaceutical companies and 26% for health insurers. About half of consumers believe health providers (51%) and hospitals (49%) make a positive difference in the nation, versus 39% for store pharmacists, 26% for health insurers and 26% for pharmaceuticals. “There’s a lot health care can improve, but we tend to paint the entire industry with a broad brush,” Salomon explained. “The EpiPen controversy, Affordable Care Act challenges, the fall of Theranos and the basic hassles inherent in navigating one’s health care needs — all of these contribute to consumers’ perceptions of the reputation of the health care system overall. But we need to remember that health care players are not viewed equally. When it comes to confidence in care sites, 27% of Millennials surveyed expressed confidence in pharmacy-based clinics, compared with 14% of Generation X and 14% of Baby Boomers. Overall, a third of consumers said they trust pharmacies as a point of care. More than half of consumers (55%) said solutions to the health care sector’s challenges will come from health care providers like doctors or nurses, compared with 47% citing patients and consumers and 38% citing government. Thirty-four percent said health insurers will offer solutions to solve health care challenges, followed by pharmaceutical and biotechnology companies (32%), hospitals (31%), academics, nonprofits or think tanks (29%), technology companies (25%) and retail pharmacies (7%).